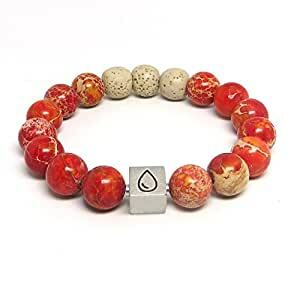 Our "Radiant Energy" bracelet is handmade with premium, semi-precious 12mm Red Magnesite stones, 3 beige lava stones and a custom stainless steel cube. Sometimes called "Red Turquoise" it has a wonderful, relaxing and calming effect when worn. These stones are often used in meditation and will help achieve balance in all areas of your life. Magnesite is said to tune into the energy of your heart and will allow your mind to align with your deepest desires; enhancing clarity of purpose.